Home > Membership > Nonprofit World > What's the Best Way to Recognize a Major Donor? What's the Best Way to Recognize a Major Donor? 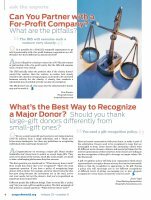 Should you thank large-gift donors differently from small-gift ones?